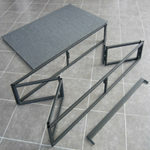 Our portable stage comes in three parts, the gate frame, the brace and the top. 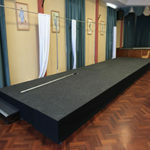 The portable stage top has a standard size of 1200mm x 1800mm and is covered with hard wearing grey carpet to prevent slips and trips while on stage. The portable stage gate frame folds flat in a concertina style action for transportation or storage and extends to form a rectangular shape. The brace is then fitted to lock the frame and provides a solid base for the stage top to be placed. 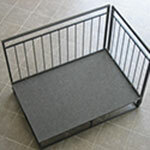 Optional chair rails can be hired to fit to the stage to provide a lip that prevents chair legs from being accidentally pushed over the edge of the stage, or complete balustrade hand rails can be hired as required for additional safety. When assembled the gate frames can be draped with black skirting cloth available to hire in 10m lengths which dresses the portable stage and hides the structure from the view of the audience. A range of steps are also available from the hire shop to allow easy access to and from stage level. The portable stage sections are available in 300mm, 600mm and 900mm heights giving the flexibility to form multi-level stage configurations to suit the performance and venue.